There are many ways to have a positive impact on the next generation of structural engineers. This is important, because they will face significant challenges to improve infrastructure while competing in a global market with constant change and ever-increasing pressures. Investing time to help them will benefit our countries, world and all of us individually. An example of an event helping students is the “Students Connecting with Industry Sessions” (SCIS) at NASCC: The Steel Conference (see www.aisc.org/scis for more details). This is the fifth year in a row we have helped AISC put together this event, and it has been helpful for students as well as practicing engineers. This year’s conference will be held in Nashville, Tenn., and 150-200 students in structural engineering are expected to attend the SCIS program on the event’s second day. The morning portion features four structural engineers of various experience ranges advising students on a variety of topics to help them as they embark on their careers in structural engineering. After the morning session, students are treated to lunch, which is followed by an exhibit-hall tour, where students can see the many products and equipment used in the industry. They can experience automated machinery for punching, drilling and cutting structural steel; a virtual welder; automated software for design; innovative structural systems or connections; and more. Following the tour, students meet one-on-one with practicing structural engineers from a variety of companies at “Direct Connect.” Many companies prepare a document with tips and suggestions for students as they begin their careers. The student event concludes with a relaxing and fun evening at the conference dinner, where students can further interact with a wide variety of people. Although the student event is only one day, students are welcome to attend other sessions throughout the conference. To make this affordable, AISC waives the registration fee for students to attend the entire three-day conference, and it provides up to $175 per student in travel reimbursement. Another student resource is the “SE Connect” group, which is part of the NCSEA Basic Education Committee. SE Connect brings together students with practicing structural engineers for career guidance. What’s a typical day/week/month like as a structural engineer for each career path? What skills/classes should students take to help them prepare? What are the most-common traits of “high achievers” in the industry? Many other concerns could be added to this list, but you don’t need to answer every question. Simply tell them your own personal experience for the career path you chose, and encourage other practicing engineers to do the same. In our experience, most of these people aren’t aware of different ways they could use their structural-engineering background that are more “in line” with their personalities and strengths. In many cases, had they known some of these options earlier, they could’ve made more-informed choices that allowed them to be happier and have more success sooner. If we can help students better understand the profession of structural engineering, it will reduce workplace turnover, because they will be happier and not be searching for other ways to find happiness and fulfillment in their careers. Most universities appreciate having practicing engineers talk to students. If you don’t have a university near your office, readers are welcome use our Web-based meeting software at no charge to hold an event for students. Simply contact us for more information. We would love to hear feedback and suggestions for helping students, so we can compile and pass them along. Take the first step today! 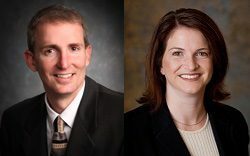 Brian Quinn, PE, is president and founder, and Lisa Willard, PE, is vice president, SE Solutions LLC, which provides the SE University program for structural engineers. For more information or to contact us, please visit www.LearnWithSEU.com.